It can be difficult or expensive to get your own hands on a fingered citron, but it’s easy to find a navel orange almost any time of the year. Fortunately, the patterns underlying the morphology of the fingered fruit can also be seen in an everyday navel orange. Between our photos of Buddha’s hands and your own navel orange, you should be able to follow along at home. 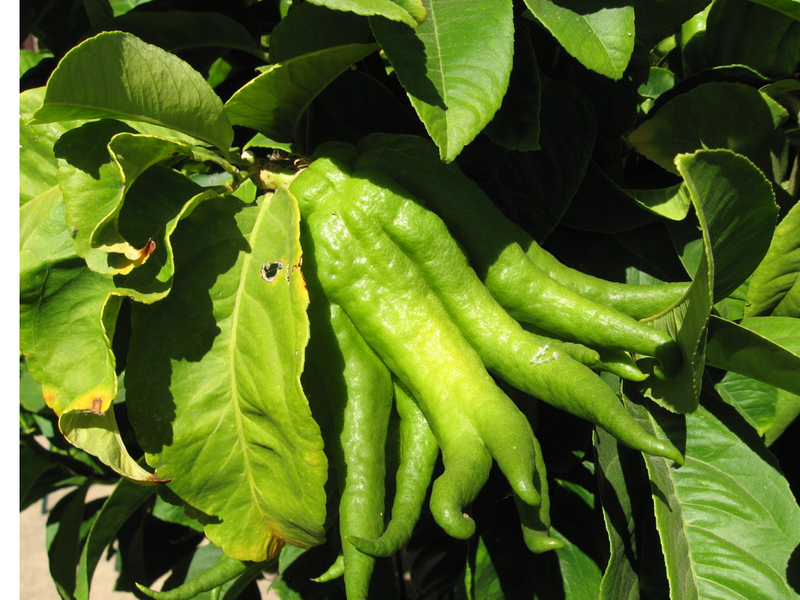 A Buddha’s hand citron is a fruit, and like all simple fruits, it is the mature ovary of a flower. Citrus fruits – from kumquats to lemons to oranges to grapefruits – are technically berries because they are fleshy throughout and do not have hard pits or tough papery bits inside. More specifically, they are a special type of berry called a hesperidium, derived from the original name Linnaeus bestowed upon the citruses in lovely and colorful reference to the Golden Apples of the Hesperides. (For a lively detailed discussion of orange etymology, see Mabberley 2004). 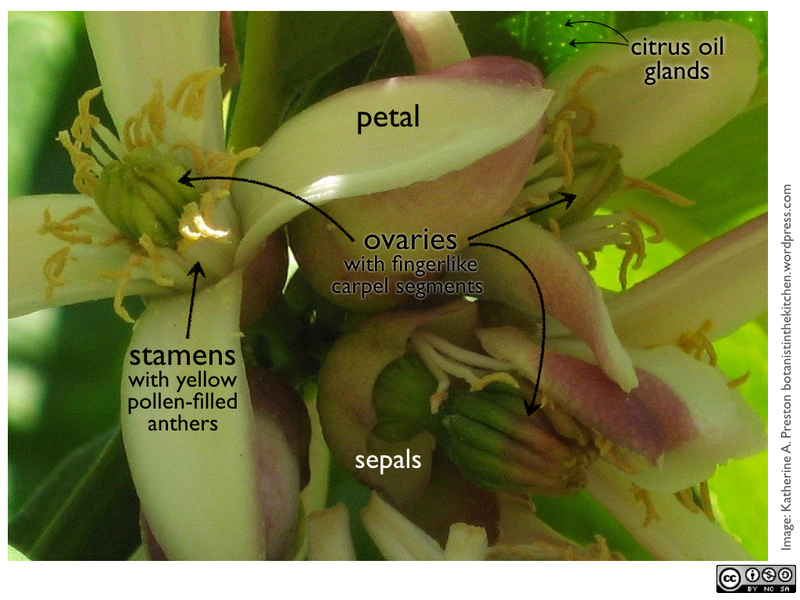 Plant ovaries (and resulting fruits) are made up of the lower parts of one or more carpels, the fundamental units of the “female” part of the flower (the gynoecium). Carpels arise at the tip of a flower extremely early in development, and in many species they gradually fuse together to form a single solid ovary with one or more styles and stigmas. Orange flowers. The smooth ovary and its thick style and stigma are shown in the center flower, from which petals and stamens have been removed. Click to enlarge. Under a microscope, the tip of a developing orange flower looks like a tall fluted bundt cake or a French cannelé, each hump a tiny incipient carpel (see images in Lima and Davies 1984). But by the time an orange flower opens, the outside of the ovary is totally smooth. The carpels that make up a mature orange or grapefruit or lemon are obvious: they are the familiar (and convenient) individual wedge-shaped segments. Among my favorite botany fun facts is that the long pulpy sacs that fill the segments and cushion the seeds are actually individual hollow hairs, filled with juice. 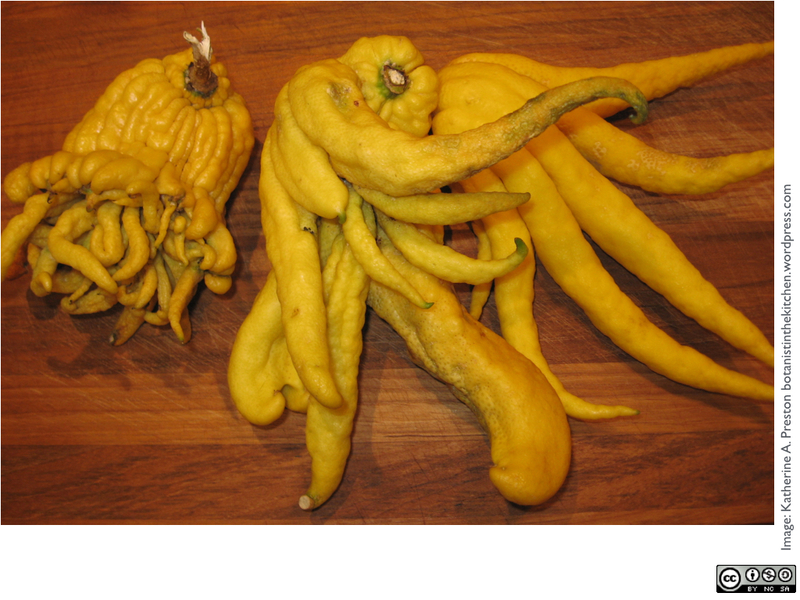 The gnarled fingers of a Buddha’s hand citron are simply separate carpels that somehow failed to fuse. This is evident when you look closely at the flowers and very young fruits of a Buddha’s hand. Instead of a smooth ovary made of united carpels, the young carpels of a fingered citron are already going off in their own directions. Many non-fingered citron varieties (such as the etrog) contain very little juicy pulp and are valued primarily for their scented zest and their very thick rinds, which are made into jam or candied. Cheap candied citron peel haunts the dreams of fruitcake haters, but homemade versions are amazing. The spongy white part of the rind (albedo) soaks up a lot of sugar syrup, and the zest (flavedo) provides an intense citrusy zing. Fingered citrons are even better suited for candying because they are basically nothing but rind and their fingered shape maximizes the ratio of flavedo to albedo. My recipe for homemade candied Buddha’s hand is below. 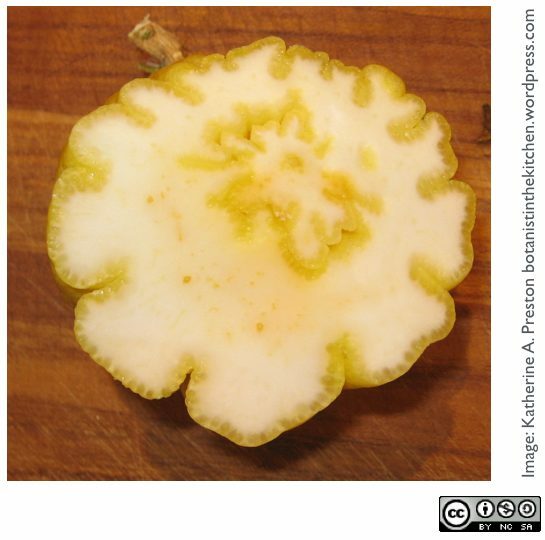 Cross section through the base of a Buddha’s hand citron. Click to enlarge. Fingered citrons also fail to make seeds and must be propagated intentionally by humans, so it was surprising when a recent study (Ramadugu et al., 2015) found a great deal of genetic diversity among eleven distinct varieties of fingered citrons from Yunnan Province in China, the presumed birthplace of fingered citrons. The authors speculate that the fingered mutation may have arisen independently several times from different non-fingered varieties, and that the trait also could have been passed on to hybrid offspring through pollen. 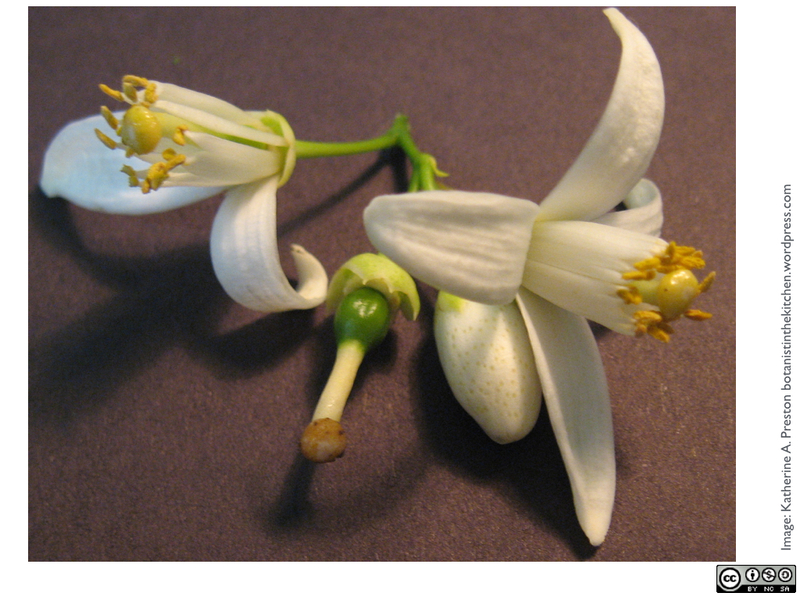 Some varieties of the non-fingered types are noticeably ridged (see photos in Ramadugu et al. 2015), so perhaps there is a genetic predisposition towards making fingers. I have not found any studies that have specifically identified the mutation responsible for the fingered trait, but several genes are good candidates. (If you are familiar with research in this area, please leave a comment). Failure to fuse explains the separate fingers of a Buddha’s hand, but it doesn’t explain why there is usually more than one ring of them. To gain insight into this part of the mystery, we need to do a little navel gazing. This kind will be productive, I promise. So what is the navel in a navel orange? 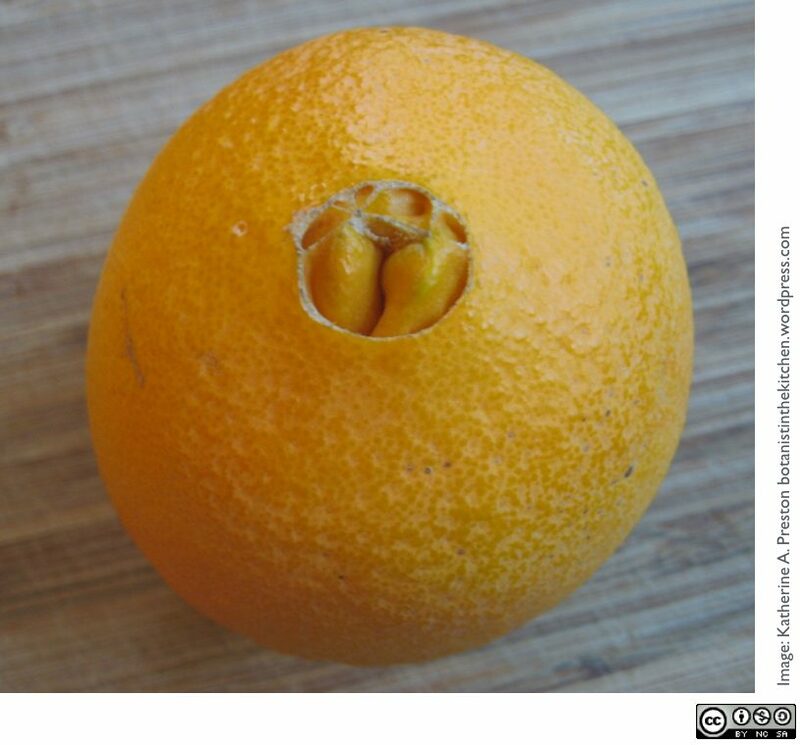 Navel orange flowers make one normal ring of regular well-behaved carpels (the bundt cake described above) but then they produce a smaller second ring inside of that. The second ring becomes the “navel.” Sometimes the carpels in the second ring fail to fuse, and each is surrounded by rind, contributing to the iconic belly button look. Sometimes the rind around the second ring just gets lumpy and pushes itself into the segments of the first ring. Meanwhile, the tissue surrounding the first ring of carpels grows up around the second ring leaving a small opening through which the navel shows through (Lima and Davies 1984). A similar developmental pattern happens in fingered citrons, but to a more extreme degree. I’ve seen what look like three rings of carpels, although they are so irregular, it is hard to tell for certain that there are not four. Even Buddha’s hands from the same tree vary in number of carpels and how many whorled series of carpels develop. Citrons (varieties of Citrus medica) represent one of the three original Citrus species from which most of our edible citrus fruits were derived through hybridization. The other two are Citrus maxima (pummelo) and Citrus reticulata (mandarin), and several recent phylogenetic studies have supported the monophyly of these three groups (e.g. Carbonell-Caballero et al. 2015). Citrons and mandarins are not bitter, whereas pummelos are. The bitterness of a citrus fruit depends on which of two enzymes is acting on a precursor molecule to generate a bitter flavanone or a flavorless one. Some hybrid species, such as grapefruit and bitter orange, express the bitter-flavanone-producing enzyme inherited from their pummelo parent. Interestingly, sweet oranges also have a pummelo parent; however in sweet oranges, a mutation in the bitterness gene disabled the pummelo version of the enzyme, leaving only the sweet mandarin parent’s version to operate in the fruit (Frydman et al. 2013). Because citrons are not bitter, their zest can be used as an interesting substitute for lemon or orange zest, and it is not necessary to purge the rinds of bitterness before making them into candy garnishes. When my botany class met again after the Buddha’s hand show-and-tell, my student admitted to having served the prize fruit to his friends, sliced into vodka tonics. Well, that was one perfectly good way to use a Buddha’s hand, but below are two of my favorites. Wash a large fingered citron to remove any dirt clinging to it. You may have to separate or remove some of the fingers to get it all clean. Chop the solid part of the fruit into chunks or sticks, as you wish. The pieces will shrink only slightly, so cut them to be close to their final size. Cut the fingers into chunks or slice them lengthwise for curls. Very small fingers can be left whole. Make a sugar syrup in the ratio of 2:1 sugar to water. For a large fruit, two cups of sugar in a cup of water should be more than enough. Ordinary table sugar works best in this recipe because it does not burn too quickly and it allows the citron flavors to shine through. Heat the sugar and water gently to dissolve the sugar and add the chopped citron. Continue to simmer the citron in the syrup, stirring frequently, until the pieces appear translucent and the syrup is thick but not caramelized. Let the citron cool in the syrup, then transfer the pieces to a large plate and spread them out. Any leftover syrup can be used as syrup or stirred into the marmalade recipe below. If you plan to put them in fruit cake or figgy pudding, you can let the pieces dry for a couple of hours and refrigerate them until you are ready to bake. If you want them for candy or garnish, let the pieces dry for a couple of hours and roll them in powdered sugar to coat thoroughly. They are beautiful strewn on top of an orange soufflé, straight from the oven, or on a scoop of ice cream. To be honest, I just use the recipe at the Earthy Delights Recipe Blog. My only comment on this recipe (besides that it’s very good!) is that my marmalade sometimes comes out too thick, with too much citrus chunk and not enough gelled matrix. The gelled matrix can also be too thick. Because there is so much pectin in the white (albedo) part of the fruit, this problem might be avoided by using only the pieces that have zest on them and leaving out some of the central mass of the fruit. No matter the texture, though, it tastes wonderful. Carbonell-Caballero, J., Alonso, R., Ibañez, V., Terol, J., Talon, M., & Dopazo, J. (2015). A phylogenetic analysis of 34 chloroplast genomes elucidates the relationships between wild and domestic species within the genus Citrus. Molecular biology and evolution, 32(8). Lima, J. E. O., & Davies, F. S. (1984). 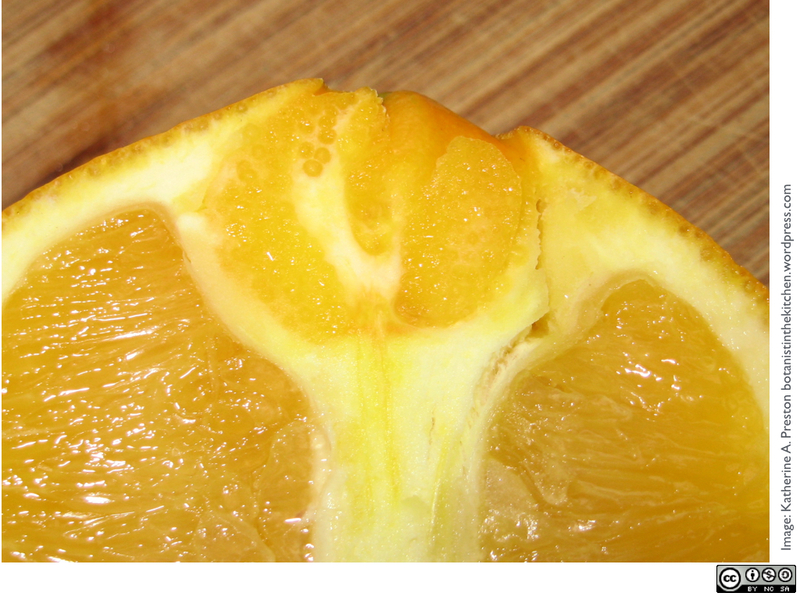 Secondary-fruit ontogeny in navel orange. American journal of botany, 532-541. Mabberley, D. J. (2004). Citrus (Rutaceae): a review of recent advances in etymology, systematics and medical applications. Blumea-Biodiversity, Evolution and Biogeography of Plants, 49(2-1), 481-498. This entry was posted in Flavor, Fruit, Recipes, The basics, Uncategorized and tagged anatomy, Citrus, flavor, fruit, fruit structure. Bookmark the permalink.